The Trinity Lavra of St. Sergius is the most important Russian monastery and the spiritual centre of the Russian Orthodox Church. The monastery is situated in the town of Sergiyev Posad, about 90 km to the north-east from Moscow by the road leading to Yaroslavl. The monastery was founded in 1345 by one of the most venerated Russian saints, Sergius of Radonezh, who built a wooden church in honour of the Holy Trinity at the Makovets Hill. The first building of the complex, the Trinity Cathedral, was built in 1422, in honour of the St. Sergius, a revered monk who founded a lot of monasteries across the country and blessed the Russian Grand Prince before the battles against the Tatars. The site of the original cathedral grew over centuries with various rulers adding churches and belfries to the complex. Nowadays, Lavra is the centre of Russian Orthodox religious life, with numerous holy water wells dotting the area and services being held around the clock. Long lines of devotees and curious tourists line up to pay respects to the famous Holy Trinity icon by Andrei Rublev. Although intended for religious purposes, the monastery played an important part in the political developments of the country. The six-meter-tall walls came in very useful during the famous sixteen-month siege by the Polish-Lithuanian troops in 1608. In 1689, young Peter the Great took refuge at the monastery during the attempted military coup in Moscow. As a token of gratitude, he ordered to build several smaller churches which completed the architectural appearance of the Lavra complex. Like with other Russian churches, there is a sign for an entrance fee for foreign tourists. However, unless you are a part of a guided tour, you can save yourself 450 rubles, as the entrance to the entire Lavra complex is free. Do resist taking pictures inside the churches, as it is a very intimate and holy experience for many visitors. 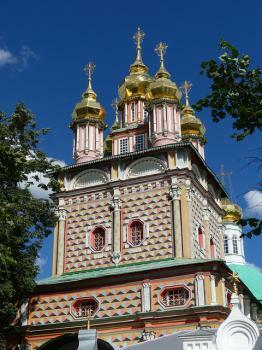 There are several reasonably-priced stalls selling pirozhki baked on the premises and the delicious monastery kvas. Finally, if you are very committed to Medieval Russian church art, you can queue up in the long line to see the famous Holy Trinity icon. I visited this WHS in August 2016. It is a very pleasant day trip from Moscow and for those who have more time it would be great to sleep over in Yaroslavyl (another WHS) after having visited Sergiev Posad as you'll be able to use the same train station. I decided to allow more time to Sergiev Posad instead of a rush visit to take in yet another WHS as there is quite a lot to see in what is nicknamed Russia's Vatican. First I took the metro to Komsomolskaya and once I exited the metro station I immediately saw the Yarolavsky railway station and I bought the return tickets for the sub-urban train to Sergiev Posad. The cashiers (look out for KACCA) don't speak English so make sure to print the name of Sergiev Posad in Russian (Сергиев Посад). There is a faster train that takes closer to one hour which leaves only at around 09:00 and 13:30 while the other trains leave almost every half an hour and take around 1hr 30mins. I found the right platform by looking at the big departures screen and comparing the Russian scrolling letters to my printed version. The return train is much easier as there are only 2 platforms and you only have to look out for the train to MOCKA. The trains are quite an experience as they are similar to a locomotive flea market with different alternating vendors and performers. Make sure to time your departure and be ready to get off the train after around 1hr 15mins (otherwise you'll end up visiting the WHS in Yaroslavyl instead!). Once in Sergiev Posad, a 10 minute walk will lead you to the Trinity Sergius Lavra (there are signs in English and Russian everywhere). 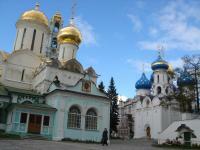 The first view is a great panoramic view of the fortified monastery with several onion-domed churches and cathedrals. Unlike the Novodevichy Convent there is no pond. Instead of ducks there are hundreds of pigeons which are fed outside the monastery with the hope of focusing their droppings outside monastery walls. When I visited it was impossible to visit without paying an entrance fee of 350 roubles. You can avoid paying the 100 roubles extra fee for photography because nobody ever checks your ticket inside as there seems to be no entrance fee for Russians. I looked all over the place but there is no mention of its WH inscription nor is there a UNESCO plaque. The only queues were those of devotees waiting in line to kiss the tomb of St Sergius however tourists are invited to go inside without having to wait in line. 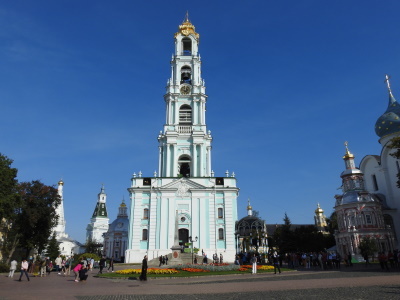 There are vespers in the Assumption Cathedral at 5pm daily (similar to the ones recorded on the CD given as a 'gift' when paying the 100 roubles for photography). The main highlight of the Lavra are the huge starry domes of the Assumption Cathedral next to the green bell tower, the pink chapel, the holy water spring, and the golden spired Church of John the Baptist. Year after year more colours are added to the facade paintings creating a disney-like effect which reminded me at times of Myanmar. However, the interior icons and murals are really worth viewing and the whole ensemble is my favourite WHS after the Kremlin out of the 4 I visited during my trip to Moscow. Don't forget to try the delicious fried potato or cabbage and leek fritters and wash them down with the local Kwas from inside the Lavra. I visited the Trinity Lavra of St. Sergius on a day trip from Mosco in June 2015. I had seen all other things in Moscow during other trips. A business partner of mine took me there by bus. After we also went to see the Chernigovsky skete and Abramtsevo Colony which are not UNESCO but well worth a visit. There were quite some busses with Chinese groups there which made the place crowded. Entrance was free (not sure if allways). Beautifull decorated churches with nice fresco's and icons. Well worth a trip! It was May 1986 when I traveled for the 4th time to the Soviet Union in order to explore more it'treasures. Having been twice on the night train from Moscow to Saint Petersburg (Leningrad in those days) I felt that I should explore more of her glorious and often, sad past. a day trip from Moscow. Traveling by bus in a Northern direction for 70 km, I found myself engrossed deeply in Russian history, as fields and birch tree groups, were sliding by. Colorful houses with picket fences and flower boxes lining the road. I found myself humming Russian tunes, those I remember my mother singing when I was a child. We were informed that this fortress-like monastery held a special position as it was - I guess in these times - the only place pilgrims from all over Russia would come to worhsip in the beautiful Cathedral of the Assumption. There were many elderly women with head scarfs gathered in front ot a fountain that spouted water. They gathered the silvery flow in bottles to take with them. The Russian Tsars would seek refuge there escaping invading enemies. There was an infermary, as explained, full operational during WWII. Walking slowly inside the cathedral, candles flickered, reflecting their light on the religious ornaments, not as elabortate as in some other places of worhsip, but very moving. Awareness of foreigners made a few women turn around and look at us. One caught my eye. She held me there and a small smile lit up her face, as she walked towards me. Her arms reaching out to me I met hers and we both stood for a moment and smiled at one another. In Russian she said 'My friend' and the tears did wel up in me. After visiting the tomb of of Saint Sergius and areas of other interest, we were gathered up and climbing back on to the bus, I knew that I would always remember this special place of humanity. A small town just around 70 km. north of Moscow is Sergiev Posad or Zagorsk during Soviet time. As the former center of Russian Orthodox Church for many centuries, the town has special position for Russian, and the town monastery also has special title called Lavra which is the highest title for monastery granted by the Tsar. The town has become famous after Saint Sergius of Radonezh has been promoted as the patron saint of all Russia then the pilgrims from every corners of the Empire made their journey to this holy town. The town monastery, which has been established by the saint himself in 1340 hence its name Sergiev Posad - Town of Saint Sergius, is located on the hill and surrounded by huge white wall making its fortress- liked appearance similar to the Novodevichy convent in Moscow but less ornate details. For inside, as typical Russian monastery the center is the five onion domes cathedral and this one is bright blue with golden star spangled, the very beautiful Cathedral of the Assumption; however, the true center for everyone is a small and dark Trinity Cathedral where the tomb of Saint Sergius located. I was so overwhelming by the whole day memorial service melody and a long queue of pilgrims as well as tourists in this small golden and colorful cathedral, one of the most memorable moment of my Russia trip. The European baroque bell tower is another landmark for the monastery as it is so different with other buildings in the complex which are built in Russian styled and inside is a shop for expensive handcrafts! 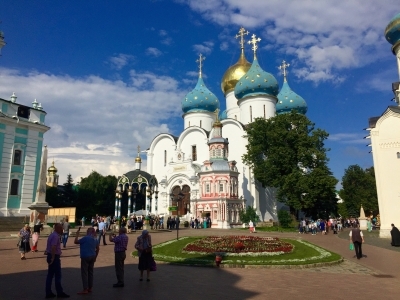 There have many things to see in this spiritual complex and from Moscow Yaroslavsky train station; there have numerous trains connect Moscow and Sergiev Posad within 1.30 hour making a perfect one day trip from Moscow. Named after a local Christian saint: The Trinity-Sergius Monastery was founded in the 1330s in the forest to the north of Moscow by the monk Sergius. Sergius was canonized in 1422 and declared the patron saint of the country.